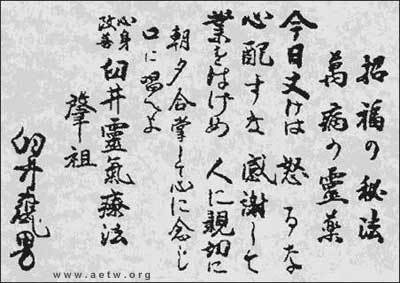 The five Reiki precepts are a major part of the system of Reiki. Students of Reiki are guided by these principles to help with their personal development and self healing. Considering each one in turn on a regular basis can help to deepen your practice of Reiki as they are central to the whole system. Your exploration of the precepts as part of any study of Reiki brings inner rewards which can contribute to your overall health and happiness. They have been translated in many ways, above is one of the most common translations, below is another. "Usui Reiki Treatment for Improvement of Body and Mind"
This short Youtube video is a recitation of the Reiki precepts in Japanese.